The Irish Waste Management Association and The Chartered Institution of Wastes Management are both delighted to be directly involved again in organising this year’s Irish Waste Management Conference 2018. Due to the conference going from strength to strength over the last number of years with delegates numbers up to well over 300 we are moving the conference to Ireland’s leading conference venue, the Hogan Suite in the Croke Park Conference Centre in Dublin City Centre. This will facilitate the catering to be all in one room thus maximising the networking opportunities as well as benefiting from the most up to date conference and AV facilities in Ireland. 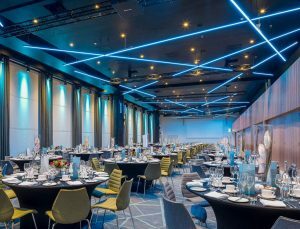 Furthermore, the Croke Park Conference Centre really is ideal for the Irish Waste Management Conference as it is the only 100% full sustaining conference or events venue in Ireland. There is also the benefit of the Four Star Jury’s Croke Park Hotel directly across the road from the venue for delegates to stay. Last year’s event was the must attend waste management event in Ireland with all leading waste management companies, policy makers, environmental engineers, senior business professionals, local authorities and stake holders meeting to discuss the theme which was Weigher to From Here!. This is the Irish waste industry’s premier education, networking and solutions event where you will enhance your knowledge and network with fellow waste professionals.